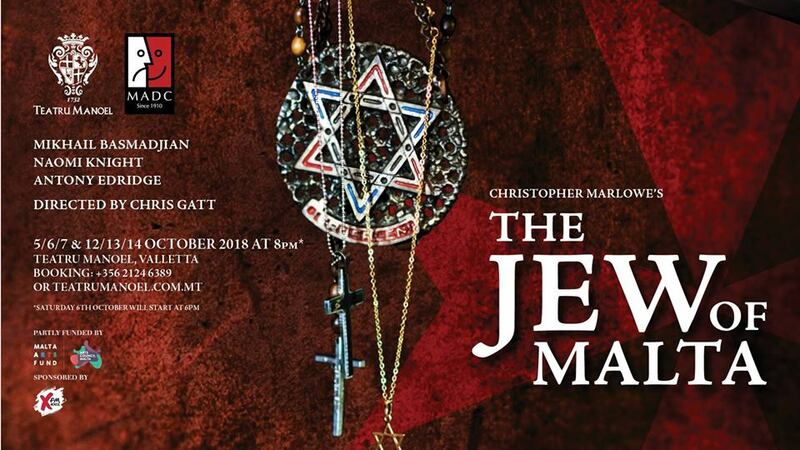 The Jew of Malta, presented to you for the first time this October, is one of Christopher Marlowe’s lesser known plays. This may be because of its strange amalgam of tragedy and fiercely black comedy. It brings together characters of the three major monotheistic faiths, and roundly condemns all three. It is, in short, and typically of Marlowe, a revolutionary play which stings and hurts even as it entertains. The Jew of Malta, a collaboration between MADC and Teatru Manoel, is directed by Chris Gatt and features Mikhail Basmadjian as Barabas, Naomi Knight, Antony Edridge, Erica Muscat, Edward Thorpe, Philip Leone Ganado, Nathan Brimmer, Alex Weenink, Joe Despasquale, Maxine Brimmer, Helen Osborne, Joe Zammit, Waylon D'Mello and Daniela Carabott Pawley. Music by Albert Garzia. Performances are on the 5/6/7 and 12/13/14 October at Teatru Manoel, Valletta. Saturday 6th's performance starts at 6pm; all other performances start at 8pm. BOOK NOW by visiting www.teatrumanoel.com.mt or call on 21246389 - Tickets at Euro25, Euro20 & Euro10 (OAP's & students Euro20, Euro15, Euro10). Recommended age 14+.